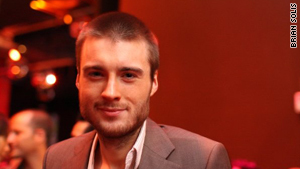 Mashable's Pete Cashmore says the time is right for Apple to tackle the TV. London, England (CNN) -- Apple CEO Steve Jobs this week rebuffed the suggestion that Apple will revolutionize TV in the same way it has reshaped the music industry, mobile phones and tablet computers. But Jobs is bluffing: The time is right for Apple for tackle the TV, and the company's re-entry into that market is a no-brainer. "Smarter people than us will figure this out" was Jobs' deflective response to a question about Apple's TV aspirations at the D8 Conference on Tuesday. Subsidized business models essentially give customers a set-top box for free, Jobs argued; why would they pay for another? He explained that the lack of a national cable operator, not to mention the lack of standards around TV, has led to Balkanization, or the breakup into smaller units: "It's a fundamental go-to-market problem." "Apple TV is a hobby," he added in reference to the company's neglected set-top box offering. The deflection is latest in a long line of half-truths from Jobs. It's a smart tactic that allows the company to lower market expectations and fool competitors. In 2003, Jobs said of Apple's rumored entry into the cell phone business: "We didn't think we'd do well in the cell phone business. What we've done instead is, we've written what we think is some of the best software in the world to start syncing information between devices." Four years later, the iPhone reshaped the smartphone market. In the same interview, Jobs proclaimed, "There are no plans to make a tablet. It turns out people want keyboards. We look at the tablet, and we think it is going to fail." This week, Apple announced that more than 2 million iPads have been sold since the touchscreen device was released in April. Jobs is remarkably consistent in his misdirection. Two years previous to the launch of the $499 iPad, he claimed: "We don't know how to make a $500 computer that's not a piece of junk. Our DNA will not let us do that." Prior to adding video support to the iPod, he professed: "I'm not convinced people want to watch movies on a tiny little screen." Before the launch of Apple's iBook store: "It doesn't matter how good or bad the product is; the fact is that people don't read anymore." Jobs' denial of a new service is by no means evidence against its existence; the contrary, in fact. The Internet-connected TV is an idea that's finally ripe for consumer adoption. Or more precisely: the TV as a platform. Apple's iTunes is an obvious starting point to turn the TV into an entertainment hub; it brings your purchased music, TV shows and movies to the big screen. But Apple TV, the company's first foray into the television business, boasted this exact integration and failed to take the world by storm. What has changed? The glaring opportunity is for Apple to bring the App Store to TV. With access to millions of applications -- including games -- on a big screen, the television would finally become engaging. The blockbuster launch of the iPad has proved that a screen, once connected to an endless supply of content and applications through iTunes and the App Store, becomes infinitely more powerful. The TV is simply a larger screen. This opportunity hasn't been lost on Google. Its upcoming Google TV product will run its mobile Android OS. The reason is simple: Thanks to Android, Google TVs will benefit from the app ecosystem Google already built for mobile phones. Google's strategy also points to a solution to the "set-top box problem": While Google will offer a separate box, the company has additionally partnered with Sony to have the software pre-installed in some TVs. Such a union is less likely in Apple's case, however: Apple has always preferred to create its own hardware. And while Jobs denies that consumers want another box in their living rooms, I'd wager that rumors of a $99 set-top box running the iPhone OS are indeed accurate. The cable operator issue is trickier, but similar Balkanization in the phone space proved no barrier to Apple's iPhone ambitions. The same will be true here. Apple may name multiple cable companies as partners or simply sidestep the problem; bringing Apple's app ecosystem to the biggest screen in the house is a compelling proposition on its own. And yet ... Jobs doth protest too much. The Apple CEO explained the cable cartel in such labored terms that he must surely be in the process of untangling that thorny issue. So my bet is that Apple will indeed strike deals with cable companies to produce a comprehensive offering for TV watchers. Will Apple take another shot at television? It's inevitable. The Internet-enabled TV is coming, and Apple is perfectly positioned to join the fray.